Writing with a very sensitive tone, Tim Chester has, nonetheless, a very positive message for those stuck in life-dominating sins: you can change. It’s possible. Not on your own, of course, but because of the power of the gospel all believers in Christ can change. As a resource for counseling it is a hope-filled book. Yet, for all its sensitivity and hope, You Can Change borders on being simplistic in its approach towards change. The work derives from Chester’s own pastoral ministry. Both in confronting his own struggles and in counseling the members of his own flock Chester has developed the material that eventually led to this book. It’s nine chapters consist of questions used to help readers think about their own “change project.” His questions are leading us to certain conclusions, sometimes as a twist to the expected norm, but always to Christ. So, for example, he asks us, in chapter one, “What would you like to change?” He concludes that if the answer is anything short of conformity to the image of Christ then our change project is too small. “Please don’t settle for anything less than being like Jesus and reflecting the glory of God” (20). All of the questions that launch each chapter are important, if basic. They lead readers to think in more focused ways. I love that part of the book. Change can feel nebulous and overwhelming. Chester wants us to think very carefully and intentionally about our change project. The emphasis is most welcomed in light of the emphasis of so many change-projects. Most change projects focus on self-esteem and medication. An emphasis on the death of Jesus for our sins and the resurrection power of God in our lives is an appreciated alternative. Yet, this emphasis can seem reductionist. His response to this truth, then, is to instruct us to believe different things, to embrace the truth. So, he outlines four key truths to help us fight the lies of unbelief: God is great, God is glorious, God is good, and God is gracious. There’s much to praise in chapter five, and yet it fails to acknowledge the dynamic influence of habituation. James K.A. Smith has done a tremendous job of pointing out the power of our habits (see, Desiring the Kingdom), and the ways in which our beliefs are impacted by our habits (i.e. behaviors). It is not merely a one-way street; it actually flows in a dynamic interplay. A person may in fact believe many great truths, but in practice has succumbed to habits that undermine those beliefs. The solution, then, cannot merely be expressed as “believe deeper.” Thankfully, Chester makes efforts to address this reality – the chapters all end with exercises and practices to engage the reader – but the emphasis is still largely sequestered to the realm of the mind. Here is a metaphor. Scripture portrays sanctification in a range of colors and shades. There are reds, yellows, and blues — with 16.8 million shades in between. So any monochromatic view of sanctification is like saying, “You are sanctified by the color red.” For some Christians, some of the time, amid some life struggles, to remember the color red—justification by Christ’s death—proves pivotal. For other Christians, at other times, facing other specific struggles, other colors prove pivotal. Chester’s approach can seem simplistic in light of the depth and diversity of human struggles. Remembering the cross does bring great comfort and encouragement, confidence and security to us as believers. But sometimes we need to remember and meditate on other great truths to help us progress. There is much to praise in the book, and I would hold it quite ahead of a host of other works on change. I found the overall format very helpful and anticipate on using it as a guide to conversations with counselees in the future. It was also very encouraging to me as I think about my own “change project.” The fact that it borders on being simplistic should not deter the interested reader. 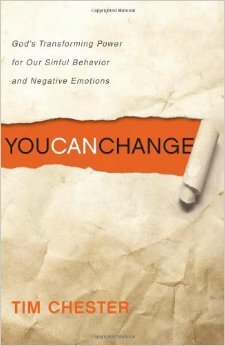 Provided that they look to other resources to help fill in some of the deficiencies of this book, I would recommend reading You Can Change.